Written by Sherri Duskey Rinker • Scholastic, 2018. 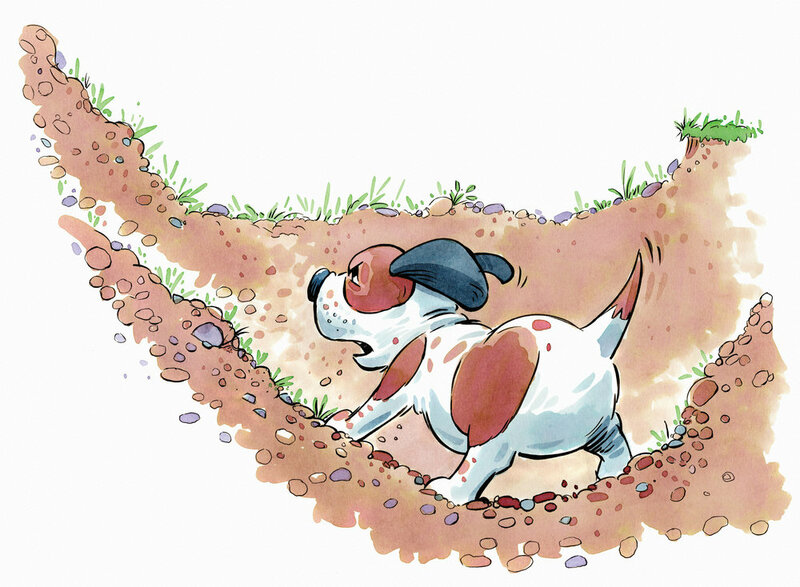 Everyone thinks Tiny is too — well, Tiny — to dig deep enough to what he's sniffed out. After two whole rounds of sketching the book in my usual style (meaning the art would eventually become detailed oil paintings), I suggested to the editor, "Maybe I should be doing this in simple watercolor, or something." She agreed. Would you rather have fur or a tail? Sherri and I ask each other silly and not-so-silly questions in this interview. Early sketch for the title page, in my usual style. My plan was to paint the final art in oil, as in the books Rules of the House and Pirate's Perfect Pet. Tiny, also sketched with detail; my usual style. At first I thought the animals who doubt Tiny's abilities could be bored with it all, but then that got too boring! My first watercolor studies of Tiny were much more simple—too simple, apparently. Tiny and the cat, simplified. Study for the bird, one of the nay-sayers that tries to make Tiny stop digging, for his own good. More detailed watercolor studies, for the big sheepdog, another of Tiny's hecklers.